This is really a trip on the wild side for a unique view of what is world-renowned as the "South Bronx." A leisurely tour that includes beautiful natural wonders of the waterfront, community gardens and art, and historic places. 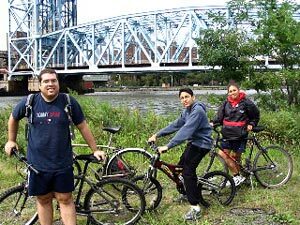 Depending upon the season and time of year, the ride will feature fresh mulberry picking on Randall's Island, free canoe paddling, or some other environmental conscious-raising activity. On this trip participants of all ages are made aware through actual site visits of polluting fossil fuel power plants and gargantuan waste transfer facilities that litter our rivers' shores. Alternatives to the existing government policies are brought to everyone's attention, with post-ride action steps including promoting demonstrations, letter writing, and email campaigns. Time's Up! provides critical outreach and promotion for this ride and early support has led to significant growth in attendance as well as continued support and involvement with the important efforts of Friends of Brook Park by ride participants. FoBP offers a video for further information about local organizing campaigns against pollution and unjust land-use siting issues.